Convenient 12 oz. spray can. 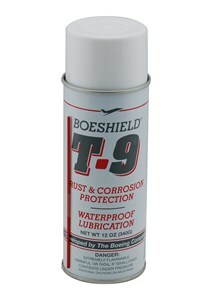 Boeshield T-9 was designed by Boeing Aviation as a corrosion inhibitor for aircraft components. Through licensing, this product is available to consumers and businesses. Boeshield T-9 is a combination of solvents, lubricants and waxes designed for penetration, moisture displacement, lubrication, and protection. A thicker coating works in places where additional protection is helpful such as on hinges, chains, undercarriages, cables and on items put into storage. To apply a thicker coating, just spray it on and leave it. A thin coating works well when direct contact is made with the surface such as on cast iron table tops, garden tools and other hand tools. To use a thin coating just spray it on and use a rag to remove the excess. 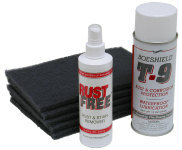 Applications of T-9 every few months maintains the rust inhibiting barrier. Unlike some sprays, it is safe on paint, plastics, and vinyl. As an added benefit it will also loosen rusty and corroded parts. 12 oz. Aerosol Can. If you need larger quantities, Boeshield T-9 is also available in one-gallon and five gallon containers. Caution: Product is flammable, harmful, or fatal if swallowed; contents under pressure. A. Coverage for a single 12 oz. aerosol can may exceed 50 square feet depending on the method of application and thickness of coating.